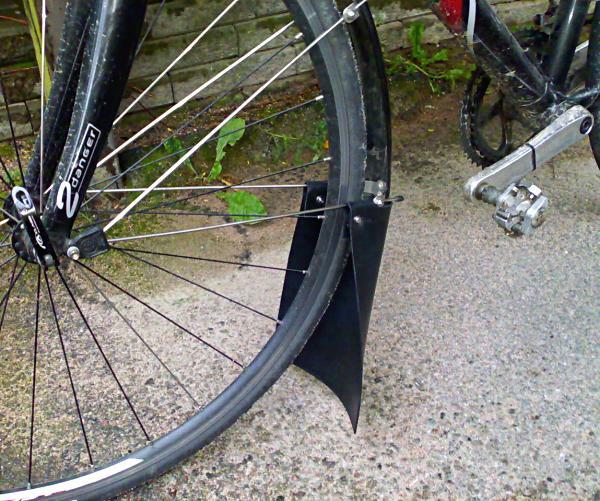 Bicycle mudguards are frequently made shorter than they should have been. I was not able to find a front mudguard which would protect front chainrings from water jets pouring from the front wheel. So I made my own from a 2mm thick rubber sheet. It is heavy and non-aerodynamic. It is heavy-duty! It makes difference when riding in the rain. It is tested. Highly recommended for bike commuters. very nice, thanks for posting the photo! I will try to make some like yours – I agree that mudflaps are never big enough and yours are the best looking self-made i have seen. very well done. I’d like to know how you have made yours exactly: What did you use to (a screw?) to tie them around the metal bar of the mud guard? I used stainless M5 screws with large washers.